Trailer Graphics are a creative and very popular way of promoting your brand and business. If you want to run a prosperous business and get several digits income as a final result, you need to be striking and effective. In case your business depends on trailers, why don’t you use them as your whip hand? Nowadays, even if you have a great product to sell or a service to offer, you won’t make it without a proper promotion. Since visual commercials are very attractive, use your trailers for advertising purposes in order to win clients. Trump up your promotion strategy and then hire the best ones to perform the installation job on your trailer. Hire Graphic Installation company. We can help you realize this big idea and launch your business. Our well-skilled and trained crew can change the overall appearance of your trailer. According to your requirements and needs, they will wrap your trailer partially or completely. If you have a travel trailer, Graphic Installation team will perform a detailed installation of travel trailer graphics, travel trailer graphics decals or travel trailer vinyl graphics. Also, we can offer you a wide palette of graphic installation services including horse trailer graphics, race car trailer graphics, tractor trailer graphics, landscape trailer graphics and custom trailer graphics. In case you need any kind of vinyl trailer graphics, we can do it. Semi trailer graphics and semi truck trailer graphics are also on our list. In short, we can guarantee flawless installations of any trailer graphic design of your choice. Graphic Installation enjoys the trust of nationwide satisfied clients. As a reputable company, we have developed a thorough and serious business strategy. The key points of our strategy are trust, professionalism, and quality. We can stretch to you anywhere in the U.S. and provide you with our first-rate installation services. Our well-experienced team is ready 24/7 to deliver the most professional graphic installation services at the highest possible standards. No matter if you want to wrap only one trailer or a fleet of trailers, we’ll reach you in a timely manner and give exactly what you expect from us. Graphic Installation is one of the best-rated installation companies in the U.S. We can reach you anywhere in the U.S. and provide you with our high-quality installation services. Also, it’s important to point out that our installation services are not only highly professional but affordable and long-lasting as well. Graphic Installation crew is goal-oriented and very efficient in terms of always providing the best possible advice and solution. It’s essential to get the highest value for the money you invest. You can always rely on our professional installers and their vast experience. They can provide you with exceptional installation services and guide you through the entire installation process. This compound process involves the choice of the right material, surface preparation, different application methods and other issues. We can spare you needless mistakes and financial losses. All you have to do is rely on our expert crew and enjoy your perfectly installed trailer graphics. Graphic Installation enjoys a nationwide reputation and trust. We believe that every client is unique and deserves only the prime quality of our installation services. Our expert team is always ready to listen to your ideas and needs. Also, in order to achieve the highest level of our services we use the most proficient tools, technology, and methodology. In addition, we strive to continuously improve our skills. Our final goal is to secure the success of every installation challenge and to justify the trust of our clients. Thanks to the years of successful installation business and our expert crew of installers, Graphic Installation company can guarantee a complete success of every installation task. But you know what they say – There’s always room at the top. That’s why we are constantly putting in our best efforts to grow and improve our installation services day by day. Graphic Installation team is very responsive and able to cope with a vast range of installation challenges such as installations of various trailer graphic designs, trailer graphic wraps and trailer graphic decals. All you have to do is choose a design or a decal that best suits your needs and leave the overall installation process to our professional crew. Also, if you are worried about the price of the overall installation process, we assure you that our services are not only highly professional but affordable at the same time. You’re at the right place. Contact Graphic Installation and book our services today. We can offer you a 100% warranty and quality experience. Don’t hesitate, book our installation services now! Graphic Installation can offer you the best installation services in the U.S. We are proud of our vast experience, professional installers and nationwide satisfied clients. Our expert team is available 24/7 on work days and weekends. Wherever you are, we will come to you in the fastest possible time. Also, our services are budget friendly and the prices of our services are created to meet different financial possibilities. Over the years, we have gained the trust of a large number of clients due to our 100% warranty, quality and client satisfaction policy. Graphic installers are very responsive, efficient and accurate. Our clients know it’s true, they’ve experienced it. You can find us in Clifton NJ and Boston NY but we will come to you wherever you are located in the U.S. Feel free to contact us or call us at (888) 888-5715. Graphic Installation professional and enthusiastic crew guarantees incomparable installation services. You want to get the best value for invested money and our job is to secure it. We can provide you with reliable, lasting and inexpensive installation services. Our installers are available 24/7, on workdays and on weekends, always there to perform exceptional installation services for you. Our deep grounded roots in graphic installation niche give only the best blooms. Reach the perfection with us, contact us, book our services today, and get the best trailer graphics installation nationwide. How are you going to attach graphics to my trailers? All trailer graphics come with adhesive backing protected by a thin removable wax layer. We apply them onto a trailer’s clean and smooth surface. How durable will be trailer graphics you install? Trailer graphics are durable enough to withstand all weather conditions, from UV rays to the wind, heavy rain, and snow. Our careful installation process increases their durability. Will graphics fall off when I’m washing the trailer or while driving in inclement weather conditions? Trailer graphics and all other vehicle graphics are exceptionally durable and won’t fall off regardless of the weather or washing. The only thing you need to be careful about is not to use a pressure washer on your graphics because it can lift the seams. Do I have to use graphics made of vinyl? Vinyl graphics are usually installed on all vehicles, including trailers. However, we will also install various graphics on special surfaces like plain backgrounds, windows, and all other areas where you need them. Is there a standard size of trailer decals? What sizes are available? There isn’t a standard size of trailer graphics and trailer decals. Vinyl is available in any size and shape. What are the types of vinyl decals and what should I choose for my trailer? There are different kinds of vinyl decals and it is important to choose the right kinds for your needs. You can choose between perforated, transparent, and opaque trailer graphics? We will install perforated graphics on trailer windows, clear graphics when you want background images visible, and opaque graphics when you don’t want a background to shine through. 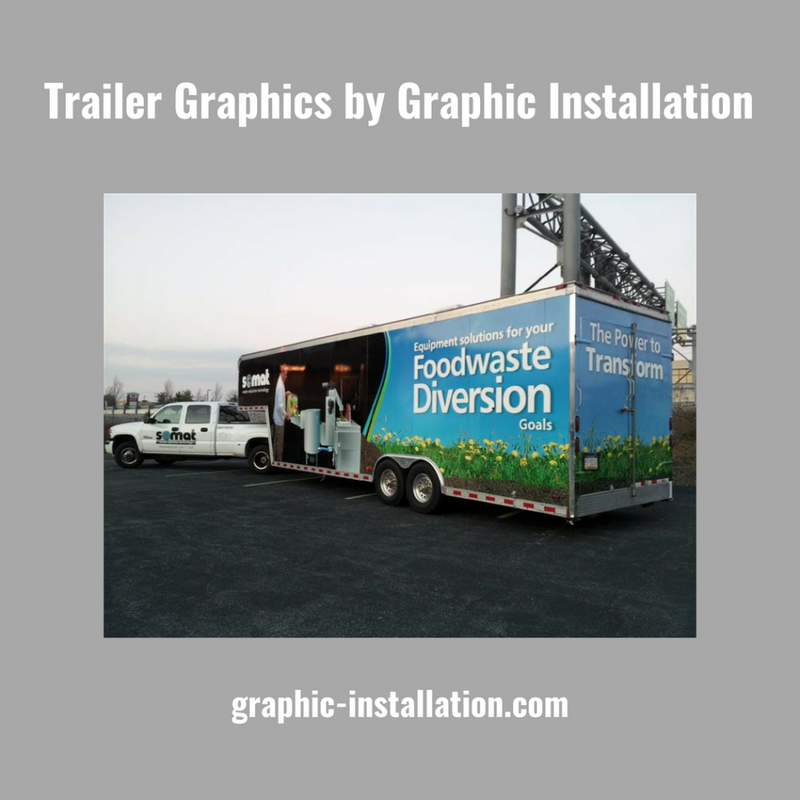 Our installation team will help you choose the right kinds of graphics for your trailer. Could I install trailer graphic myself? We do not recommend to anyone who is not an installation professional to install trailer graphics by themselves. 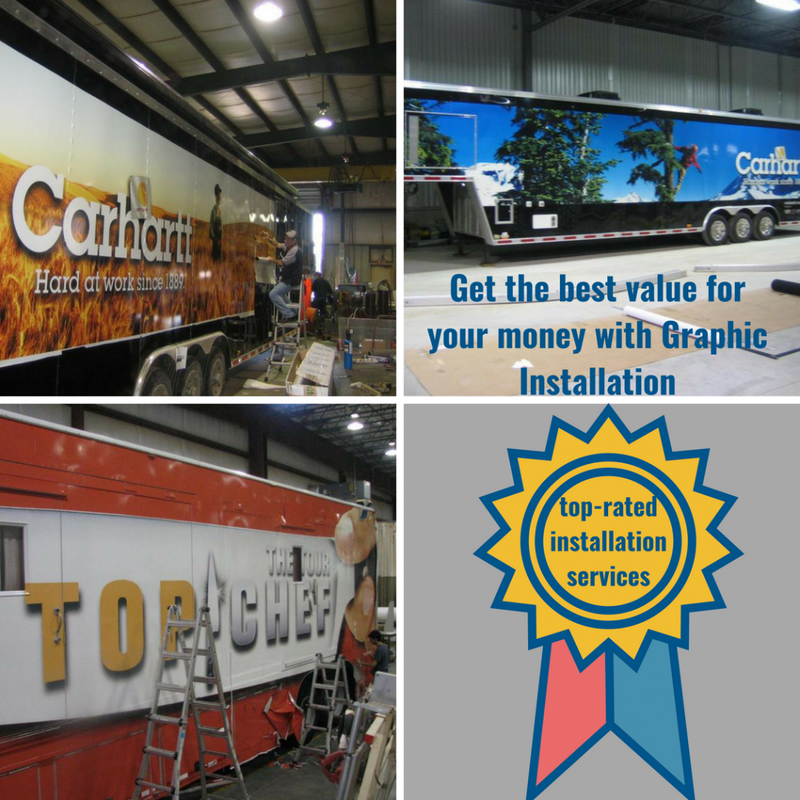 If you don’t have any experience in installing trailer graphics, the damage may be irreversible and you may have to buy completely new graphics for your installation project. However, if you decide to do it by yourself, make sure that you apply the graphic on a clean, smooth surface. Is graphics removal complicated and can it damage my trailer? We can remove your graphics appropriately without damaging your trailer. Are there any legal requirements or implications for installing signs on a trailer? Please inquire at your local police station. The requirements may differ depending on the state where you reside. Mandatory trailer lettering may be required by some states for licensing.